“When I go home I’m going to build some homes for the homeless and set up some funds for drug addicts and alcoholics,” said 30-year-old Fury. 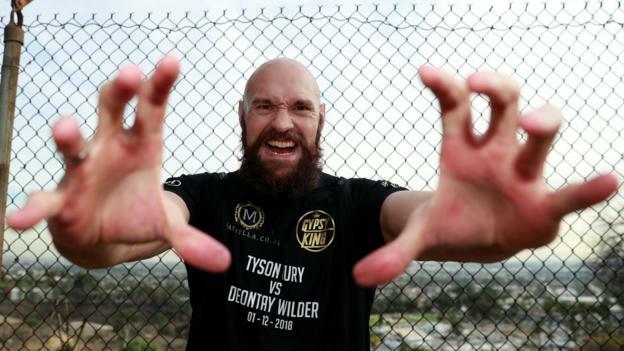 Fury has been training in California and has been struck by the amount of homelessness in America’s most populous state. In various areas of Los Angeles, tents can be found on road sides, under bridges and in parks. In February, the Los Angeles Times reported around 55,000 people were without homes, a growth of 75% in six years. “It has really opened my eyes to a lot of things and I’m leaving as a better person,” said Fury, who has been in California for around nine weeks. “It’s opened my eyes to see so many different cultures, so many different things happening and going on. “You think you might be in a third world country but it’s a crisis situation and something needs to be done about it. Is Fury ready for the fight? Fury will fight Wilder, 33, at the Staples Center in Los Angeles on Saturday – 04:30 GMT on Sunday in the UK. Around 13,500 tickets had been sold for the fight on Monday, with organisers expecting the arena to be filled to 17,500 on fight night. On Tuesday, both fighters attended fire stations in the city to present free tickets to firefighters who have helped battle recent wildfires in California. Fury said he will remain flexible in his approach to taking on Wilder, insisting he will be prepared to “box, fight” or “go in the trenches”. “I stand here sincere, I ain’t here for no money, a pay day. I’m here to win,” Fury said. “I’ve never been as fit or ready. In all my career, I’ve never had two wins back-to-back in the same year like this year. I’ve always had massive inactivity.